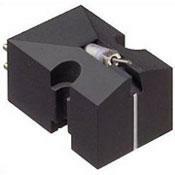 Denon's classic low output moving coil cartridge, in production virtually unchanged for 40 years. Decent sound for the money. Not harsh or sibilant. Good midrange. Undefined bass, boring highs, lack of 3 dimensionality. I could tell it had a conical diamond as soon as I put it on my table. After listening to this cartridge for about a month on my Linn LP-12, I don't even want to listen to my turntable anymore. This cartridge sounds like it was created in the 60's because it was. It lacks three dimensionality, and the bass is undefined. The mids are good, yet the highs are plain Jane. This cartridge doesn't seem to do anything terribly wrong, but it does not make me want to listen to music on my turntable, and that is not good. I do not think this is a good match for my Linn equipment, maybe it will match yours better. I will take an Audioquest AT95e on my LP-12 any day over this Denon DL-103. In fact I would prefer many, many Audio-Technica or Ortofon cartridges over this one in the same price range. To be fair I have only listened to this cartridge on my LP-12 and the bass will probably sound less tubby on a solid plinth. Very good soundstage, very low noise level, good dynamics. This far outshines every comparably priced cartridge in its class and outperforms many costing multitudes more. Using an ADC test record, the DL103 clearly recreated 1K and 5K tones and when seperated left & right had no discernable crosstalk. I've heard that it does not track as accurately as some other cartridges but I've never been able to get it to mistrack even on some of my most demanding LPs. Its eliptical shaped stylus may prove a disadvantage in regards to record longevity. Based on reviews I had read over the years, I decided to purchase the Denon DL103 as my first foray into low output moving coil.Based on its price point, I did not expect much from it and my primary intention was to evaluate a new phono stage. In comparison, I had several Moving Magnet cartridges in my inventory that were 2-3X more expensive than the DL103. Once I had it mounted and calibrated to my low mass tonearm, I was immediately smitten with how well it sounded. It became obviously apparent why this cartridge has remained in production and virtually unchanged for over 40 years. Performancewise--It recreates a very delicate high end and accurately portrays delicate instruments. Small bells, tambourines, percussive triangles which were indistinguishable with my more expensive cartridges suddenly were clearly evident. At the other end of the spectrum, the lows were tights and pronounced. The bass was not muddy or boomy. To verify my experience , I reinstalled my more exepensive MM cartridge using the same phono stage and auditioned the same materials again. This time, I confirmed that the Denon clearly outperformed my more expensive MM cartridges in almost every aspect. Its quiet, articulate, and smooth. This humble cartridge has a well deserved reputation as an audiophile grade bargain. It is well deserved. Vivid and dynamic are the key words, all the rest of the standard sonic aspects very good. Hard to get better midfi sound for the money. Sounds like they are in the room. Some may complain about 2.5 gram VTF, but I use Last Record Preservative and Last Stylast every side of play, brush my records before and after each play with a carbon brush, always wash used ones w/99% isopropol and steam distilled water 1 to 4 mix, and I'm careful about arm setup. . Record wear? Yeah, right. You need good preamplification, a good step-up transformer or a good phono preamp that puts out 100 ohms is a must. Also a tonearm that's heavy enough or an arm like mine that is connected to a paddle that sits in silicone fluid and can be adjusted for cartridges of different compliances. Well-Tempered Record Player, late 90's vintage, completely stock. Musical Fidelity XLP2 3-can setup w/XPSU power supply, hardwired. Jolida JD 202a w/Underwood mods.